The countdown to Christmas is on and Playa del Carmen has recently come alive in a show of light, color and Christmas cheer. A huge tree has been erected in front of the Sanborns department store in the center of town, decorated beautifully in red and gold. It seems the residents of Playa del Carmen take Christmas cheer very seriously – hotels, stores and local homes are stringing lights, tinsel and decorations, and trees are popping up all over town. Playa del Carmen is in bloom with hundreds of bright red poinsettia plants, which really enhance the festive atmosphere around town. Poinsettias love the heat and lots of light, so if you pick one up for your condo, place it somewhere where it can get lots of both. Some may find it strange to celebrate Christmas in the tropics, but here at Condo Hotels Playa del Carmen, a ‘white Christmas’ involves digging your feet into the fine sand of the Caribbean at Indigo Beach Club! Instead of hot cocoa and egg nog, Christmas drinks include creamy pina coladas and refreshing margaritas while watching the turquoise waters lap against the shore. Christmas day viewing includes miles of white sand beaches and sparkling seas instead of old movies! Events and fiestas are happening every night around town, from the Mexican night at Indigo Beach Club on Wednesdays with unlimited fajitas and traditional pozole, as well as two-for-one cocktails at Imprevist. Don’t worry about not being able to find traditional Christmas fare – the supermarkets are stocked with chicken, turkey, ham and all the trimmings for those who would like to prepare a meal in their fully equipped kitchen. Or better yet, why not make use of your very own private chef to create a Christmas meal for you and your loved ones you will never forget! Indigo beach club is also putting on a sumptuous spread at their beachfront restaurant in front of the El Taj hotel. Don’t have a tree? Well, that is easily fixed! How about a Caribbean-style Christmas tree? The kids will love it, and best of all, there is nothing to clean up afterwards and no messy pine needles! Whatever you decide to do for Christmas, whether entertain on your private terrace, relax by the pool or soak up the sun at the beach, you can be guaranteed it will be a holiday to remember. While the sun is shining instead of the snow falling and the margaritas are flowing instead of hot cocoa, there is no shortage of Christmas cheer in Playa del Carmen. Come celebrate with us and experience a white Christmas – Caribbean style – on the beach! 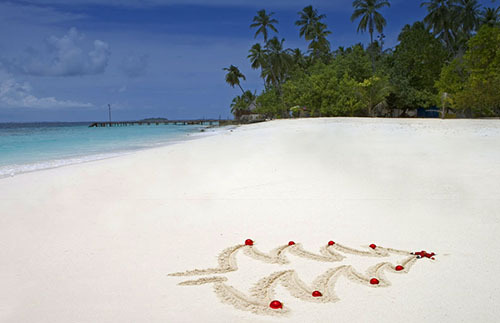 Celebrate Christmas on the shores of the Caribbean with us!